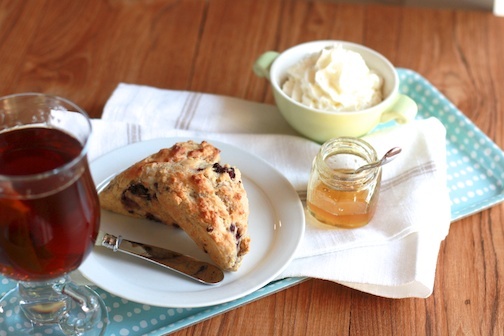 There are a lot of scone recipes out there. 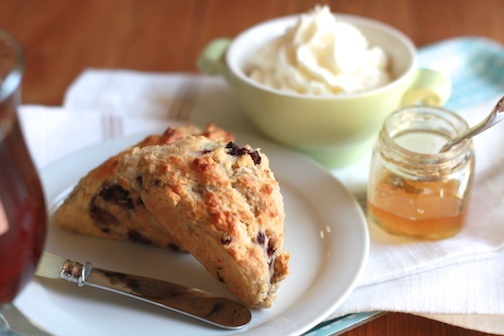 I tend toward a more traditional cream scone, but I did not happen to have any cream in the house…so a little internet research turned up some alternatives, and a few seemed promising using evaporated milk. After reading through them and finding some consistencies between them, I sort of made up my own recipe, fingers crossed that it would turn out. Since it is the new year…and I’m sure you all have resolutions that you are trying to keep…many having to do with eating healthy, getting fit and watching your weight…here’s a little bonus! Using evaporated milk makes these scones lower in fat. You can substitute evaporated milk for heavy cream in many recipes, it provides the thickness and creaminess without the added fat. 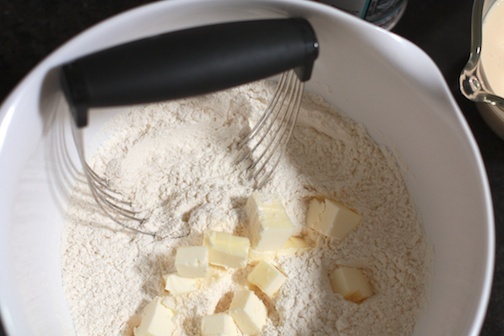 Mix your dry ingredients together, then dump in the cold chunked butter and cut it in using a pastry cutter or two forks. 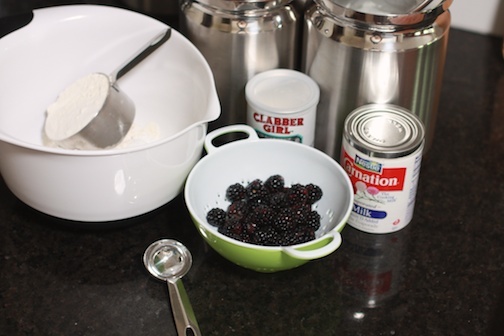 Before adding the evaporated milk, toss in the blackberries. This helps them to stay whole and forces you to barely mix the batter once the liquid is added. Pour in the evaporated milk and mix very gently. It’s okay if the berries break up a bit. 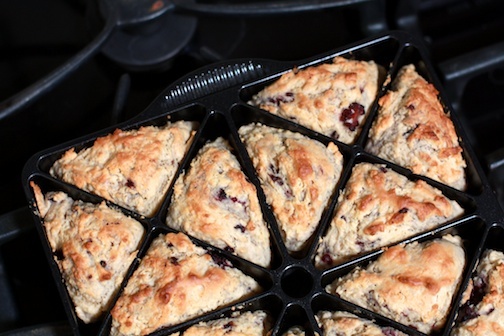 Spoon into a scone pan (we scored this one years ago from our wedding – but they are not really necessary), or dump batter onto a greased cookie sheet and spread into an approximate circle or square. 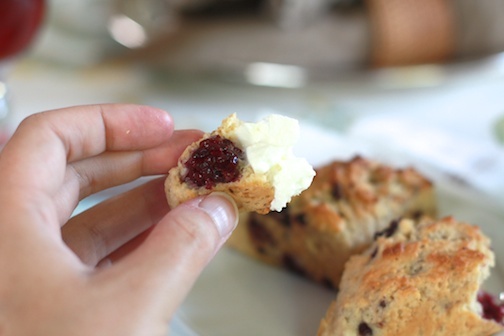 Then using a pastry scraper or a knife, divide the dough into scone shapes (wedges, squares, triangles…whatever you fancy). 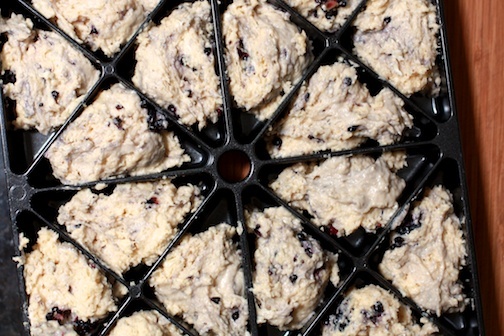 Bake in oven set at 400° F for 12-20 minutes depending on the size of your scone. You are looking for tops that are golden brown. Once they’ve come out of the oven and cooled just a bit, serve them up with honey, clotted cream, lemon curd or butter and of course, a cup of tea! 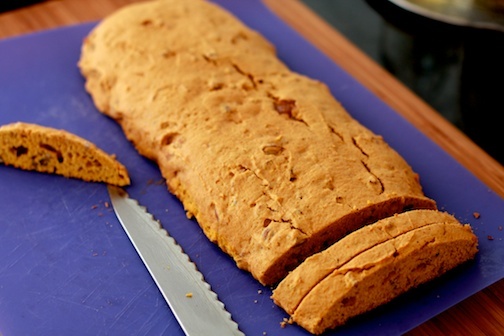 Pumpkin Pecan Biscotti are an annual tradition for us. 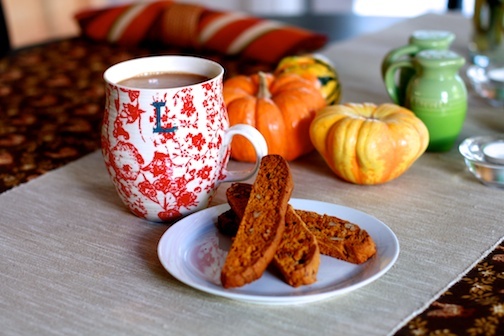 It would not be autumn without pumpkin cookies and my husband is a sucker for biscotti. Also…I’m guessing that you’ve got an extra can or two of pumpkin lying around from Thanksgiving. These biscotti are perfect as it seems just a teensy bit too early for christmas cookies – it’s barely December! 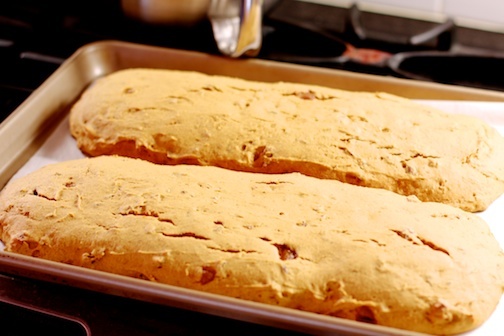 Full disclosure…original recipe comes from my family cookbook and stops a few steps short of making biscotti. 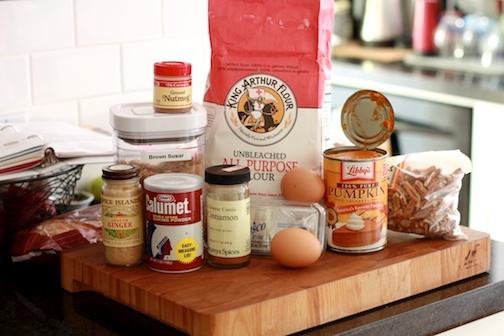 I love the original pumpkin cookie, which turn out a bit cakey and only get better the second and third day. 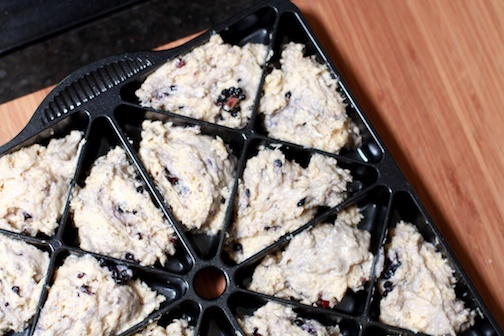 Feel free to make those as well – only difference is you spoon the batter into dollops on the sheet pan – they end up looking a bit like scones! We came up with the biscotti idea as Woody prefers crunchy cookies…not cakey ones! Preheat the oven to 400° F. Mix sugar, shortening, eggs and pumpkin thoroughly. 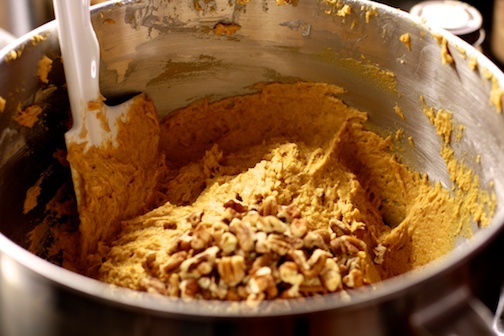 Mix dry ingredients and add to pumpkin mixture; blend well. 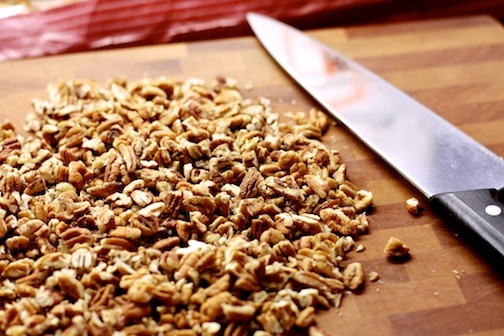 Chop the pecans and fold in to combine. I like my biscotti pretty nutty! 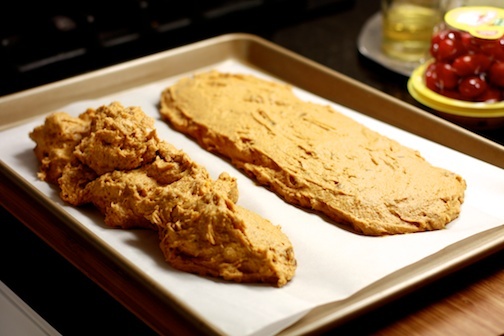 Pour and scrape the batter into two logs on a parchment lined half-sheet pan. 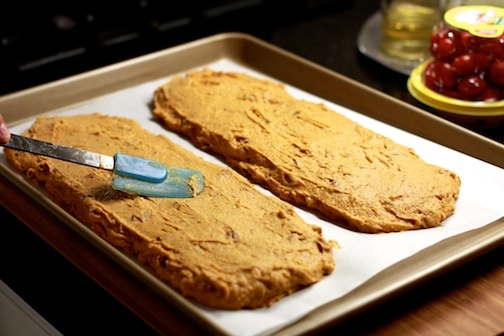 Using a spatula, flatten out the batter so the biscotti loaves will cook evenly. Bake in the oven for 15-20 minutes until the tops are just beginning to brown. You want the loaves to be cooked through, otherwise slicing them cleanly will be difficult and gooey, but not so cooked that they will burn when you put them back in the oven! Once removed from the oven, let them cool completely (they will smell really good…and it will be very difficult to not nibble the edges)! 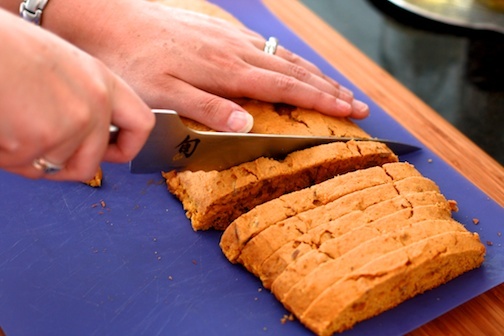 When the loaves are cool, gently lift onto a cutting board and slice in 1/3 to 1/2 inch slices. Lay the slices sideways on a parchment lined cookie sheet and bake at 325º for 25 to 35 minutes. I know that is not very specific, however, this is the part of the recipe that takes a bit of experience to get it right. You want to dry out the biscotti without toasting them too much – so think low temperature for longer. Every oven is different and you could probably do this at 250º for much longer. It is also important to note that they might not seem done when you remove them from the oven, but remember that as they cool…steam (i.e. moisture) is escaping and they will continue to dry as they cool. 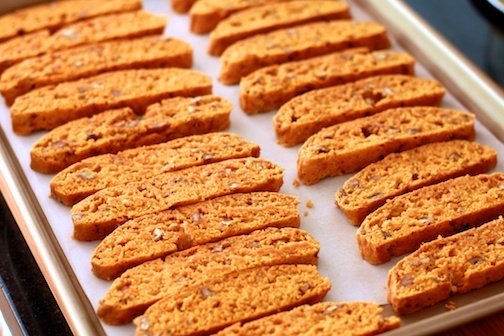 Cool the finished biscotti completely before storing them in any airtight container. Serve up with a steamy cup of coffee and enjoy at all hours of the day! Okay…now it is on to the next holiday…Christmas, OF COURSE! Prompted to bring a dessert over to a friend’s house for a small potluck dinner, I began scheming to find a dessert that was not overly sweet, involved a bundt pan (the husband’s been asking for of a bundt-something-or-other), and brought out the best of late summer (no pumpkin or other quintessential fall ingredients involved). Thank you Interwebs…and Martha Stewart! 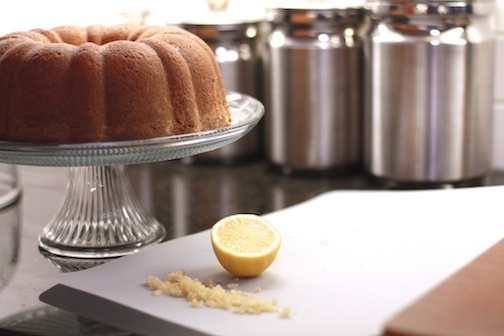 I stumbled upon her recipe for Lemon-Ginger Bundt Cake and it seemed perfect! A buttery, citrus cake with the added brightness of ginger. 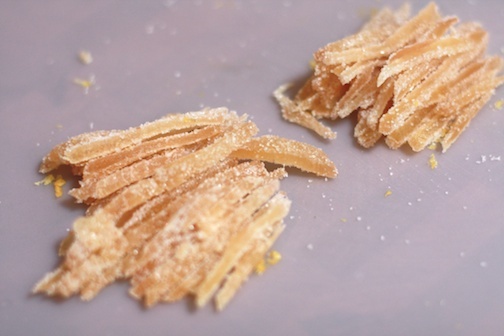 I am definitely adding this one to my recipe box, it was quick, a bit intriguing with the crystallized ginger and had just the right amount of sweetness. Don’t you just hate it when Martha is…well, Martha? Preheat oven to 350 degrees. 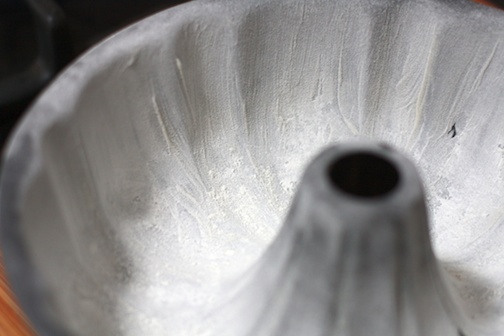 Butter and flour a standard 12-cup bundt pan. 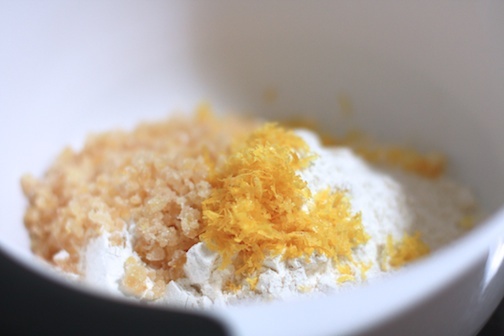 In a medium bowl, whisk together flour, lemon zest, ginger, baking soda, and salt; set aside. 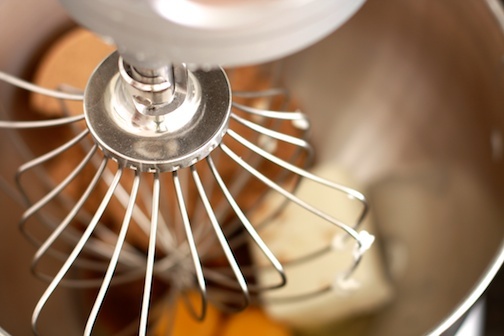 Using an electric mixer, beat butter and granulated sugar on medium-high until light and fluffy, 4 to 5 minutes. 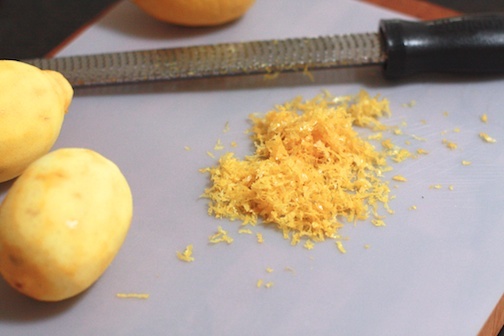 Add eggs one at a time, beating well after each addition; mix in lemon juice. 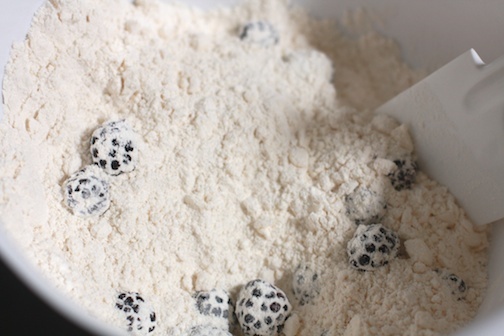 With mixer on low, alternately add flour mixture in three parts and sour cream in two, beginning and ending with flour mixture; mix just until incorporated (do not overmix). Spoon batter into prepared pan, and smooth top with a rubber spatula. Firmly tap pan on a work surface to level batter. Bake until a toothpick inserted in center of cake comes out clean, 55 to 60 minutes (if cake browns too quickly, tent loosely with aluminum foil). 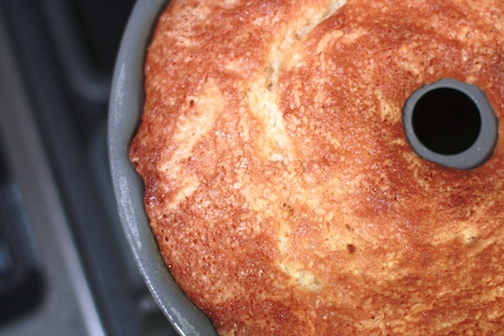 Let cake cool in pan 30 minutes, then turn out onto a rack to cool completely. (To store, wrap cake in plastic, and keep at room temperature, up to 3 days.) Dust with confectioners’ sugar before serving. As previously mentioned, we carted this bundt over to our friends and let it cool a bit more before dusting with powdered sugar (as Martha suggests), and unfortunately ended up with no pictures of the sliced cake as it disappeared quite quickly. I just love how bundt cakes get that lovely dark crust on the outside and hide their fluffy cake texture inside. I think I’ll be making this again soon! You know the days when all you want to do is come home to some cookies made by someone who loves you, and enjoy them just out of the oven while you sit there and complain vent discuss your crappy day…? Spoon onto baking sheets. Bake at 375° for 12 minutes (‘though Mom finds this too long sometimes). Be generous with sugar for more thin/lacy/crunchy cookies. 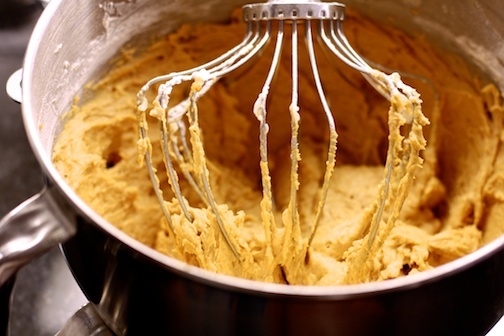 Quick tip…when my mom was making cookies regularly for the 5 of us to nibble on after school…sometime during the day, she would plop the stick of butter into the Kitchenaid bowl on the counter and by the time she started the cookies, the butter was room temperature and ready to mix! 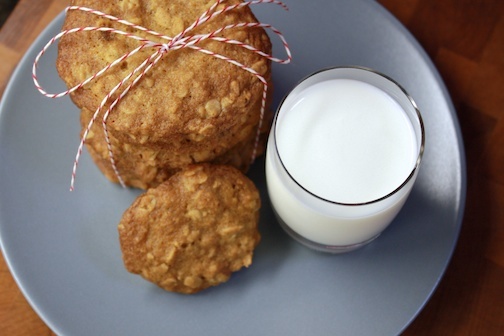 Perfect cookies to enjoy with just a small glass of milk! What is your go-to comfort cookie? If you ever spent the night at my house when I was in high school…chances are these biscuits look familiar. They were a standard on weekdays and weekends growing up…and a favorite of friends of mine and my siblings. A stop by parents always meant chocolate chip cookies (afternoon) or baking powder biscuits (morning). Who doesn’t need another quick breakfast in their repertoire? Preheat oven to 425°F. 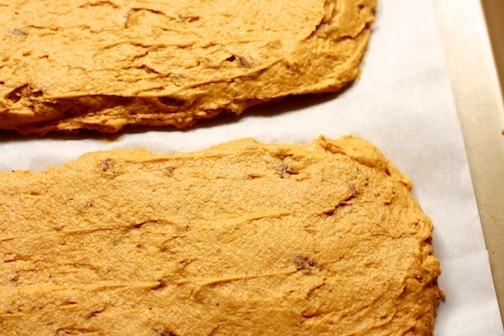 Place a sheet of parchment paper on a cookie sheet. In a large bowl combine dry ingredients and stir to mix. Cut in shortening ‘til mixture resembles coarse meal. 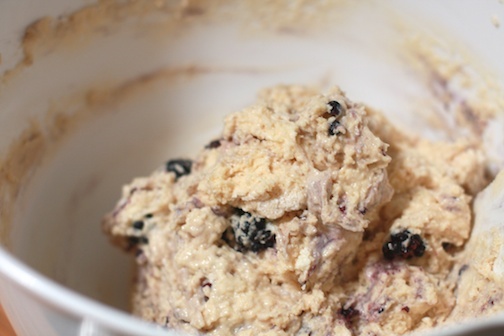 Add the milk all at once and stir with a fork just until dough forms a ball. Turn dough onto a lightly floured surface and knead 14 times. Pat (or roll) until ½ in. thick. Cut into rounds with cookie cutter size of your choice. Place on cookie sheet, spaced out or next together. Bake 15-20 minutes until lightly browned. 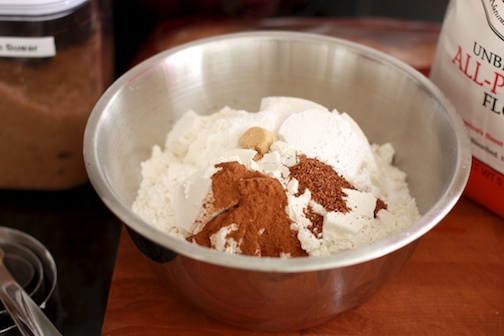 It’s surprisingly tricky to photograph all white ingredients in a white bowl….note to self – add in some color next time! Clockwise from bottom left: flour, sugar, salt, milk, cream of tartar, Crisco, and baking powder. Cut together using a pastry cutter or two forks. You want pea size pieces of shortening coated in the dry ingredients. When the biscuits bake, the shortening melts in and makes the biscuits flaky and delicious. Add the milk all at once and stir together with a fork, just until it comes together. Toss out on a floured surface or counter top and pat out (or roll if you don’t feel like working that hard) until the dough is 1/2 to 3/4 of an inch thick. Err on the side of too thick…as thin biscuits turn out like hockey pucks. I always try to get as many biscuits out of the first roll-out, then I squish all the dough edges back together and pat it out again and cut a few more biscuits. The only drawback to patting out a second set is they won’t rise as uniformly. Best eaten warm and with a homemade jam and some soft sweet butter. We enjoyed ours with last summer’s strawberry thyme jam. Say you’re asked to take part in a Chocolate Cake Challenge in honor of friends moving out-of-state, that will take place at a ‘going away dinner’ in their honor. You have weeks to prepare…and you think about what adventurous recipe you might tackle. The Chocolate Cake Challenge, despite its name does not require the entry be in cake form. It just needs to have chocolate as one of the main components of the dish. I pondered a savory enter of mole, perhaps cream puffs with a chocolate bacon drizzle, homemade hot cocoa, a frozen chocolate treat perhaps; the choices are infinite. I ultimately decide on Decadent Chocolate Cake – the most commonly baked cake in my parent’s house. My brothers enjoy this not only as an evening dessert, but a perfect morning shot of sugar – breakfast cake. Now consider as well, that this evening competition was scheduled to take place the day after the dreaded and stressful Tax day of April 15, and let’s say that, unlike previous years, you were one of those procrastinators who lost all track of time, and had the “holy %$#*&” moment a few days prior, realizing that THIS Thursday, taxes were due. Assuming all this is true…here is the play-by-play of the events that led to the following disaster success, no, well, both really. 6:30 pm – Liz arrives at grocery store to purchase important ingredients for Decadent Chocolate Cake according to the Connelly family cookbook including Bakers Bitter Chocolate squares. 7:15 pm – Liz spends 45 minutes at the store in shock and disbelief that they do not carry the necessary Bakers unsweetened chocolate…AT ALL. They carry semi-sweet baking squares, chocolate chips, dark chocolate, peanut butter chips, toffee chips, dark chocolate bars…but seriously, no Baker’s Unsweetened Chocolate Squares. Liz searches her magical internet phone for exact cacao % and tries to match it to some substitute ingredient. If you’re a Cohen brothers movie fan, this is the first moment that things begin to go wrong…which then of course leads to continual small disasters and ultimately ends with someone’s life in ruins – think Fargo. I should have known I was doomed. 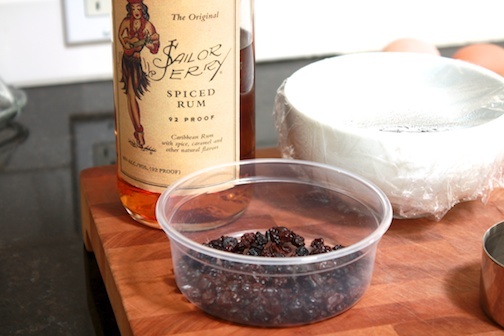 7:45 pm – Liz arrives home with take out dinner and ingredients…and begins baking. Reads recipe over again and thinks…hmmm…that seems like a lot of sugar – 2 cups, really? 8:30 pm – Liz forgets to remove the 2 tbsp of flour from the 2 cups called for in the recipe…and thinks crap…maybe I just ruined the cake…but thinks, maybe I’ll add a little vegetable oil to try to avoid a dry cake. 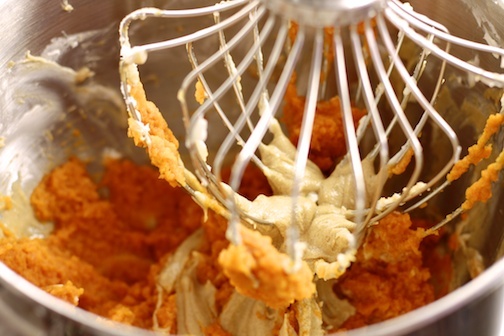 8:45 pm – Egg whites whipped – mixed in – batter looks surprisingly light in color…hmmm…hopefull it’ll darken when it bakes. 8:50 pm – cake goes in to bake for 40-50 minutes. Smells good…Liz is still thinking it is not totally ruined – there is a chance. 9:40 pm – Liz removes cake from oven after testing with toothpick and it comes out clean. Cake is left to cool for 15 minutes or so, so I can turn it out onto a plate. 10:00 pm – turn cake pan over on plate…nothing happens. Nothing. No clunk, no thud, no easing of the cake out of the pan and onto the plate. Remove plate – shake pan around, use spatula to try to loosen cake from the pan…cake seems loose – place plate on top of pan and flip over one more time. Wait a few minutes…as if that might help it work. Liz: “Look – 1/2 the cake is still stuck in the pan…and the other 1/2 is on the plate. Broken. Cake. Woody described the cake as tasting like a sugar cookie (not even a chocolate sugar cookie) hiding in a bundt cake, and in fact, even said, it tastes like something he would eat (read: I don’t like cake unless it is made with pure sugar (angel food cake) or contains vegetables (carrot cake)). So, I threw in the towel. Decadent Chocolate Cake – you and I will meet again someday and this time…you will do as I say, and turn out perfect. But all was not lost. Thanks to Woody and his last-minute desire to enter his own chocolate masterpiece. In the midst of my baking disaster, a chocolate success story was in the making. Woody made some delicious brownies that incorporated a non-traditional dessert ingredient – Chipotle Chile’s in Adobo. He made a regular batch of brownies and then added some special ingredients. I can’t divulge exact amounts – secret recipe and all…and frankly, I don’t even know exactly what he added, although I think there was some adobo sauce, maybe a little garlic powder, a sprinkling of ginger and cumin as well. All I know is that the kitchen smelled of enchiladas and brownies all rolled into one. Woody resisted the urge to try one that night and waited until the party the next evening. The competition was fierce and the voting was very serious. In order to vote, you had to try every chocolate dish entered in the challenge; tiramisù, chocolate mousse cake, mini-mint chocolate double layer cakes, chocolate Kahlua bundt cake, dense chocolate petits fours, and ice cream filled cream puffs with a drizzle of chocolate sauce and lastly, Woody’s spicy chocolate brownies. Everything was truly tasty, incredibly rich and I loved seeing how everyone interpreted the challenge. Each person voted for their first and second choice. The votes were tallied and the results finalized. Ralph announced the winner. The trophy (which will be passed down in the next annual chocolate challenge) is actually a 4H trophy from Ralph’s early years raising sheep…1991 to be exact. Of course, it was slightly modified with various chocolate stickers. Woody saved the day! The Fischer name will remain an honorable one in kitchens across Pasadena. Maybe he’s a baker after all. What happens when you add lavender to cookies?